Palermo is a city of merchants and markets. You can really buy everything. From international stores, shopping malls to its historical markets, such as Ballarò and Vucciria considered to be among the oldest in the world, Palermo has always been endowed with an impressive variety of products, antiques and collectibles to envy any other modern city that can not boast the same mix of cultures. The center of Palermo offers, to his citizens and visitors, many shops and interesting shopping spots. One of the best places is Via Ruggero Settimo, where you can just walk around and buy many goods as clothes, jewelery, shoes and so on. If you’re looking for something a bit more “exclusive”, maybe you want to walk just a bit more towards Via Libertà, where you can find the most fashionable boutiques of the city. On the other hand side, if you’re looking for souvenirs or cheaper goods, you need to walk on the other direction, towards via Maqueda, and then to Via Vittorio Emanuele. Then you can just explore any part of the city. 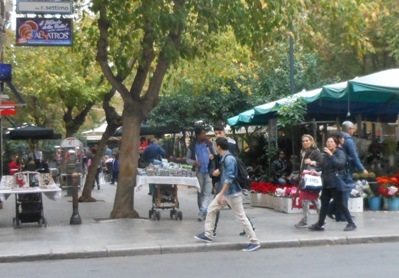 Via Roma, Corso Calatafimi, Via Notarbartolo and Viale Strasburgo, are the most popular shopping spots inside the city. There are some shopping centers too. The biggest are Forum Palermo (Via Pecoraino), Conca d’Oro (Via Lanza di Scalea) and La Torre (Via Assoro).